Chattooga County is located in northwest Georgia and was named for the river that flows through it, a word derived from the Cherokee who once inhabited the area. The county was created by the Georgia Legislature in 1838. In less than a decade, one of the county's first textile mills started production and remains a major employer. Chattooga County voted against secession from the Union but endured General Sherman and thousands of his Union troops and, later, the Reconstruction years following the Civil War. Its numerous hills and wide valleys made the county a natural resource for farmers, from cotton fields to peach orchards. Its agricultural roots and rural heritage are still evident. Several professional ballplayers, a world-renowned folk artist, and a nationally known defense attorney have all called Chattooga County home. Author Greg McCollum grew up in the county seat of Summerville. A graduate of the University of Georgia's School of Journalism, he established a website dedicated to old photographs of Chattooga County. 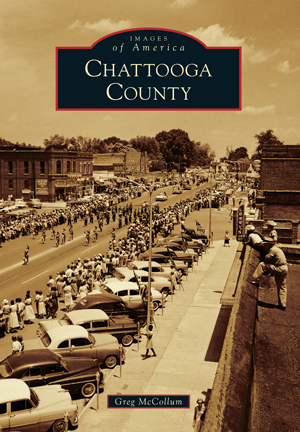 The author is a member of the Chattooga County Historical Society and served as its president. McCollum conducted an extensive search for vintage photographs, eventually locating over 60 sources for Images of America: Chattooga County.